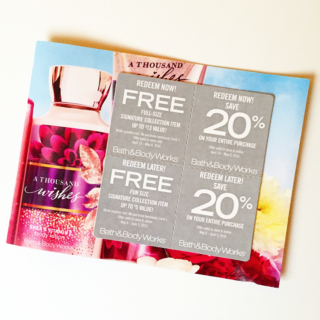 Did any of you get these Bath and Body Works coupons in the mail over the last few weeks? This mailer has a coupon for a free full sized Signature product and a free travel sized product, as well as some awesome 20% off coupons. If you’re not getting these yet, you can sign up to get them! You’ll receive free coupons in the mail – usually at the start of each season, or when they’re featuring or launching a new signature fragrance. These are the coupons that let you get a free full size signature collection item and free fun size signature collection items (no purchase required). They also include 20% off coupons that you can use as well. If you’re not on their mailing list yet, you can sign up next time you stop by a store. Just give the sales associate at the register your phone number while checking out. The phone number is associated with your mailing address, and you’ll start receiving coupons the next cycle. You can also just go ahead and call 1-800-756-5005 at the beginning of each season to make sure you’re on the list for that quarter. When you call, it’s also a good idea to double check with them and make sure that your phone number and mailing address match up. I would like to get free coupons for Bath and Body. Love that store. Love this offer! Thanks for sharing! Such a great offer!! Thank you for sharing this with us, I will go sign up! Looking forward to trying out new products! Hi i would love to have it. I am going to call the 800 number so I can get on the list and not forget when in store. Thank you for the info! Thank you for this tip, never knew you could receive full size products this way. I signed up by calling the number. It only took a few minutes! Thanks! I to didn’t know about this I shop here a lot. This is a deal I really will appreciate. I thank you for hooking us all up with these great deals everyday. Bath and Body Works is one of my favorite stores! I love going there and buying for myself and others! Yess this is awesome I go here all the time !! I love this store please send me coupons please. Thanks for the heads up! My teen and I Love to shop at Bath and Body Works and savings means more visits! When ever there is a free sample opportunity, I click on the e-mail link and find out I’m too late. Hi Olivine, yes, many of the offers are popular and they run out very quickly (some are only valid for a day or two! ), so you have to act quick to get one! So exited to try this one! Omg I’m so glad I stopped by here ,I will run to the mall tomorrow to sign up for these coupons ! This is really nice of you , I have been wanting to grab some goodies from there, they have some of the best bath bubbles and lotions. Oh wow this is really good to know, thank you!! Oh yes indeed, send me these! They will never sit in a drawer, they’ll get used. We love Bath and Body . We shop there a lot. Would love to get coupons. Thank you very much! I have always wondered how so many people snag so many awesome deals. Now I can become one of them. Bath & Body Works mails out great coupons. You just have to remember to use them. I will have to share this news with everyone I know! This is one of my favorite stores to go to when I need good gift ideas. I had no idea this offer was available. Thanks for the heads up! Bath and body works is awesome great quality products! My favorite is moonlit path! What a great deal. Thanks for sharing! I wasn’t aware of this. I will give them a call. Thanks for sharing! Thanks for the tip, this will help. Thank you for posting the phone number too. I would appreciate coupons I love shopping! Bath and body works have great deals going on all years .these coupons in the mail would be great. Bath and body works have great deals going on all year.These coupons in the mail would be great. I’d like some coupons sent in the mail please!!! PLEASE !! PLEASE bring back your Frozen Daiquiri!!!! It was my favorite !!! Thanks, I would love coupons from there. I can’t wait to try this. As a parent, coupons and freebies are almost a necessity. I would love to get coupons for b&b..absolutely love that store!!.. How do I get these in the mail?? Wow, I had no idea. Thanks for the info, I’m going to call today to see if I can get on their mailing list. Wow this is awesome!!! I am going to try to see if i can get it! This is exciting. I love bath and body! I used to be on their mailing list then stopped getting coupons when I moved. Now I know how to update, thanks! You can double up if you get their emails. I love Bath and Body Works products. They all smell wonderful and their lotions are the best moisturizing lotion. I am glad to know about this. Wow!!! This is such a great idea! I love bath and body works and I’m always searching google for coupons..Thanks so much for sharing! This is good to know. I will sign up. Thanks for posting! Thanks so much! I’m a big fan of Bath and body Works so this will definitely help me soo much!! My wife loved bath and body products thank you for sharing this information! It would be awesome to get these coupons from Bath and Body Works.I love their products.Thanks for the heads up. If you love Bath & Body Works, this is a must-do! Free product and a coupon! Thanks! i too would love to get any coupons at all for any free beauty or bath products. I will try phoning the number in the post as i am unsure of which store i am to sign up at or if you could give me very clear instructions that would be awesome. (sometimes i dont understAnd when everyone else does..i guess i need told twice lol) thanks for this awesome website I love it!!! This is Awesome!! I love Bath & Body Works! Not only that but those coupons would sure come in handy for Christmas Shopping. I would like to receive coupons through the mail as well. Would a cell phone number work if you don’t have a land line? Thanks. I don’t shop there a lot but it would be nice to have the coupons…. The thing with me is when I have coupon I always make sure to use them.